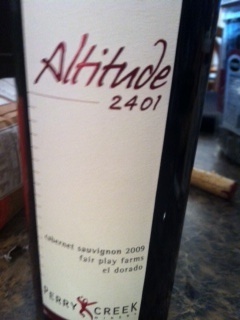 Whether there is great cause for celebration, or it’s Friday night and you have made it through another dog-eat-dog week, I have one wine to set the week apart and recommend, “Altitude 2401” Cabernet Sauvignon 2009 from Perry Creek Winery in California. I don’t need much fanfare to tout this wine. It is a dark and brooding Renoir painting that you pick up at the garage sale down the street on a sunny afternoon. In short, it is complex without being hard to understand. In a word, it is deli cious. The Wine: has deep notes of blackberry and baked plum, paired with your favorite leather jacket from high school that has mellowed and crackled with age. On the sidelines are soft, smokey oak notes that blend into the inner depths of this wine that makes it relaxed, approachable, and probably the best table wine you will drink all week. The tannins are soft (I would say like the petal of a rose, but don’t wan’t to wax too poetic) and the finish is a medium long finish. It’s a drink now wine–and drink it as much as you can. I drank this wine during a dinner party tonight, so it had to be shared, and because there was only one bottle, I will make the workout. But if I were alone, I would have hermitted away to finish this wine by myself. “Live today, for tomorrow we ride” seems appros pos for opening another bottle (if I had had one). Perry Creek has a number of good–and great–wines. I found this during a trip to visit the family and have since joined the wine club. And the in-between-wine-deliveries club (I started my own group, you could say). But if you don’t live in California, and can’t get there soon–I would say troll online for a bit and find one to suit your taste.